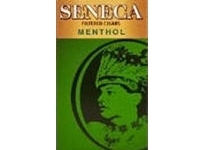 Seneca Menthol Filtered Cigars come in 10 packs of 20 filtered cigars each. Hello, SENECA MENTHOL ARE SUPERB! I USED TO BE A NEWPORT SMOKER AND I ENJOY THESE MORE..THEY ARE NOT TOO STRONG AND ARE FULL FLAVORED MENTHOLS...HIGHLY HIGHLY Recommended!